Who does not know them, the button box, the cookie jar or box with the "collected works". Also with us a lot has accumulated. We offer many different buttons for do-it-yourselfers. Partly individual pieces, sometimes also several buttons in different colors. 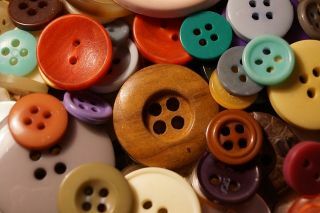 Almost all buttons are made of wood, partially painted, partly unpainted in original condition. They are particularly suitable for knitted, crocheted and sewn own creations. Especially for children's clothing we have cute motif buttons like bees, flowers, kittens and much more. The imagination knows no limits. Important: All buttons come from Import, so they are not "made in germany".